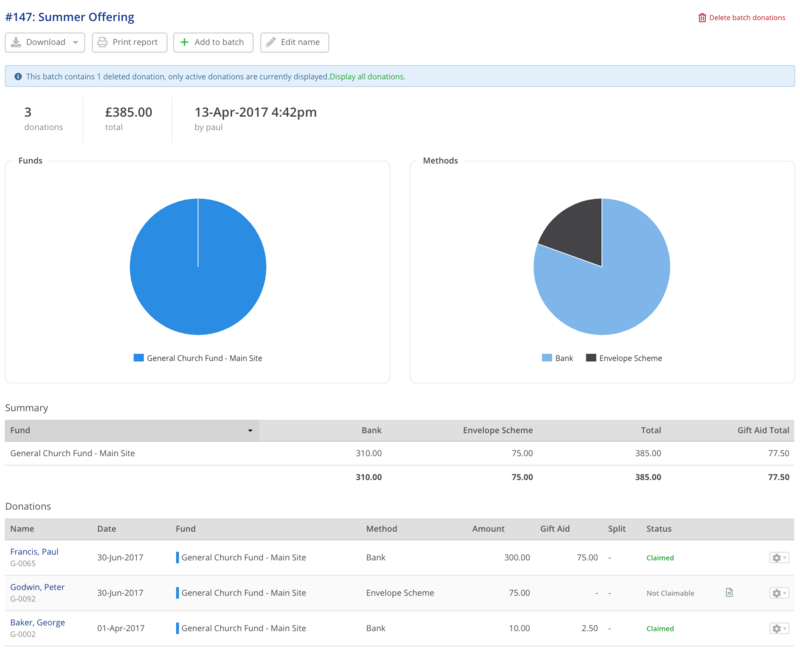 There are a variety of ways to record donations in the Giving module; each designed to suit the different workflows of churches. Once recorded, these donation records form the basis for powerful financial reporting, accounting journals and Gift Aid claim submissions. ...or, from the Donations index page, select Add donation from the Add drop-down menu. Begin by searching for the Giver - you can search by first name, last name, or giver reference. ...or you can select "Add giver" to create a new giver profile, choosing whether the Giver is to be linked to an existing contact In the Address Book, or Not in the Address Book. Complete as much information as you can. You can backfill missing information at a later time. A valid postal address and postcode is required to reclaim UK Gift Aid on a giver's donations. Click Save Changes when you're finished. The new giver profile is created and you can now resume adding their donation. Select the Fund, enter the donation Date and Amount. Next, select the relevant giving Method. If Cheque method is selected, an additional Cheque # field is provided. Optional donation Notes may also be added. Where a giver has one more active pledges, you can optionally assign the donation being added against the appropriate Pledge, or select --Not linked to a pledge--. For UK churches only, if the giver is designated as a Couple, you will also have an option to override the Gift Aid Split between the Giver and their Spouse (the default % split is set in the Giver's profile). UK churches only also have the option to override the Gift Aid Auto-detect for the donation. ordinarily the system will auto-detect for a valid Gift Aid declaration covering the donation date and fund, and set the donation's Gift Aid status to either Unclaimed or Not-claimable accordingly. It's also possible to Override a valid declaration for situations where a giver has specified Gift Aid is not to be claimed (e.g. GAYE, CAF Voucher, Stewardship, where Gift Aid has already been claimed at source), even if there is a valid declaration for the giver - the donation's Gift Aid status will be set to Override. It's further possible to set for a One-off declaration to be automatically created against the giver to cover the donation date and fund - ideal for processing Gift Aid envelopes, where the envelope is the declaration - the donation's Gift Ad status will be set to Unclaimed. North American churches will have the alternative option of specifying whether the donation is tax deductible. Finally, once you are happy, click Save Changes to record the donation. Donation notes are distinguished by a "note" icon shown on pages in the Giving module where donations are listed and on on-screen reports - hovering your cursor over the note icon displays the donation's Notes. The full donation note is included in CSV report downloads where donations are listed in the report results. Adding a batch of donations works in exactly the same way as individual donations. Select "Add batch" from the drop-down "Add menu". From here you have the choice to create a new batch, or to add donations to an existing batch. Selecting the latter displays a drop-down batch 'search' menu. For this article we'll simply proceed with creating a new batch. Give your batch an optional name e.g. "Christmas Offering". ChurchSuite will also assign the next consecutive batch number to your batch. Enter the batch donation date and then specify any batch defaults which will be applied as you add donations to the batch (these can be overridden of course, at the point of entry). For an explanation of the Gift Aid defaults, see the previous section on adding individual donations. Moving down the page, you can now proceed with entering each donation in your batch. Begin by searching for the giver (by first name, last name or giver reference). ChurchSuite will auto-suggest as you type; or you can add a new giver. Next, proceed with entering the details of each donation in the batch, working methodically from field to field, beginning each donation with a giver search (or Add giver - see above section for adding a new giver). When you are finished, save your changes. You can save incomplete batches and return to them later. Simply follow the instructions above to "Add batch" but then select "Add to an existing batch" from the drop-down menu. Then you can make changes to your batch. Upon saving the batch, a batch summary is displayed showing the Fund summary and giving Method summary, followed by a listing of the donations. You can return to this page and view, edit or manage your batch at any time. Simply locate your batch from the Donations page or Batches page, and click on the batch number/name. 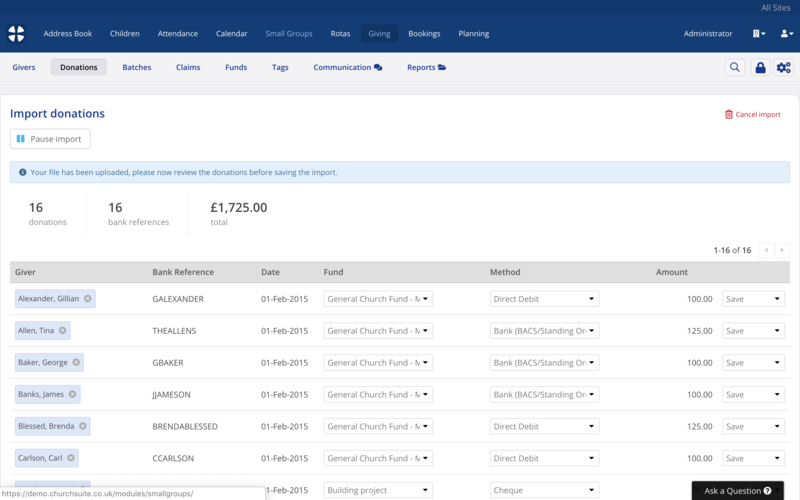 Here's how simple it is for churches to import their standing order/direct debit donations from bank statements straight into the ChurchSuite Giving module. Once ChurchSuite has 'learned' the bank statement payment reference associated with each giver, future donations will automatically be matched to the correct givers in subsequent statement imports. As part of the process, you will be able to add new givers and other information much more quickly than doing these things separately. When importing your church's bank statement, you can go through each transaction in the list (only credit transactions into your bank account are shown in the list) and decide which giver you want to link the transaction to, based on the bank statement payment reference. Non-donation credit items on a bank statement, such as deposit interest and gift aid refunds, can be dismissed. During the import process you can set which fund you want the donation to be assigned to (e.g. regular giving, building project, etc.). If you've just started using the Giving module and haven't set any of this information up yet, the information can be entered as part of the import process, which will save you a lot of time! The only thing we recommend setting up before doing your first bank statement import is to create your "Funds". For more information on Funds please see the article "Setting up and managing giving funds in ChurchSuite". To upload the bank statement to ChurchSuite, it needs to be in either the .CSV or .OFX format. Most banks supply their bank statements in the OFX format, however either format is suitable. Once your statement is in either one of these formats, you're ready to get started. Spreadsheet programs like Google Spreadsheets, Microsoft Excel or OpenOffice.org make it easy to create and save a CSV file. For ChurchSuite to be able to import your CSV file of donations, it must have the file extension .csv and it must include a header line that defines which column headings correspond to the fields within ChurchSuite. Acceptable column headings are shown in the section "Creating your CSV file" on the Import Donations page in the Giving module. Go to "Giving" > "Donations" and click the Import donations button. Click Choose file, select the file you want to import, then click Import CSV or OFX File. The next screen displays a preview of the data that is going to be imported. At this stage no actual data has been imported. Note the CSV Header column - this can be helpful to ensure the incoming data is matched correctly to the data fields within the Giving module. Use the drop-down field selector under Import As to ensure each column in your import file is assigned correctly. Once you ate satisfied, select Import All Records to complete the import. After import the screen displays all of the items of income (Credit transactions) from your bank statement import (Debit transactions, i.e. expenditure, are disregarded). Some income entries may not be donations - note the drop-down menu next to the Amount - simply switch from Save to Delete, which will ignore all the non-donation items when the imported list is processed. Using the Bank Reference from your import file, ChurchSuite will attempt to match the donation to your existing givers - based on the stored bank references against your giver profiles. Bank references should therefore be unique, to ensure that only the correct giver is matched. You can unlink a matched giver from a donation and link them to a different giver - however, you should consider updating an incorrectly matched giver's bank references in their giver profile. ...to search for the appropriate giver, or to Add [a new] giver. 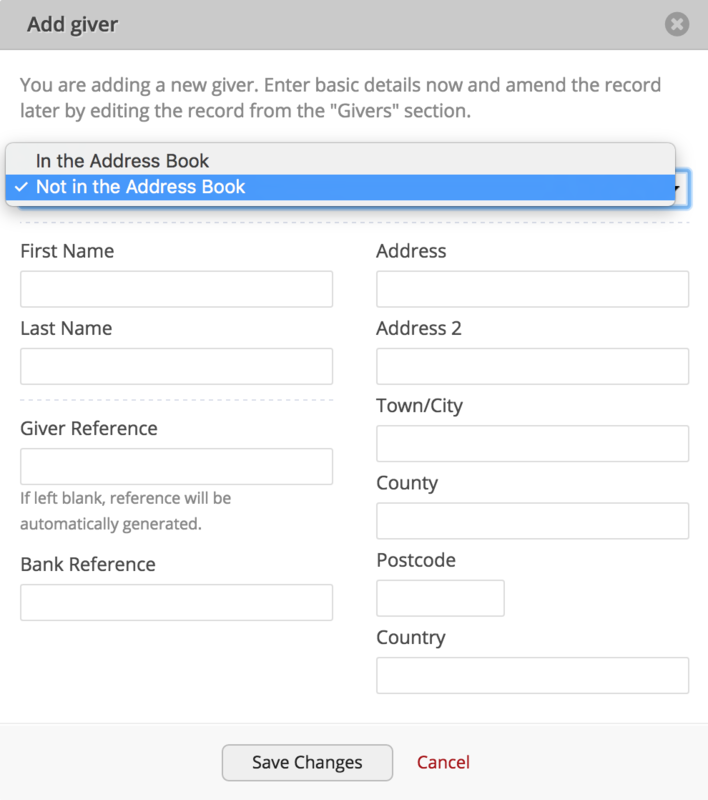 ...to select the Giver is drop-down and select Not in the Address Book. You can then set up a new unlinked giver profile - perhaps because it's a donation received from a visitor to your church. Complete as much information as you can - probably just a last name and first name/initial - depending on what information is available from your import file. You can easily back-fill missing information in the giver's profile later if you wish. Note however, that without a valid postal address and postcode you will be unable to reclaim Gift Aid (UK only) on the donation - the donation's Gift Aid status will show as Not claimable after import. Click Save Changes to create the new giver profile and link the donation to the new giver. ChurchSuite will also save the bank statement reference against the new giver profile so that when it encounters that same statement reference in a future import it will auto-match the donation to your new giver. In doing this, over time your "unmatched" givers will reduce and more and more of your import donations will auto-match. 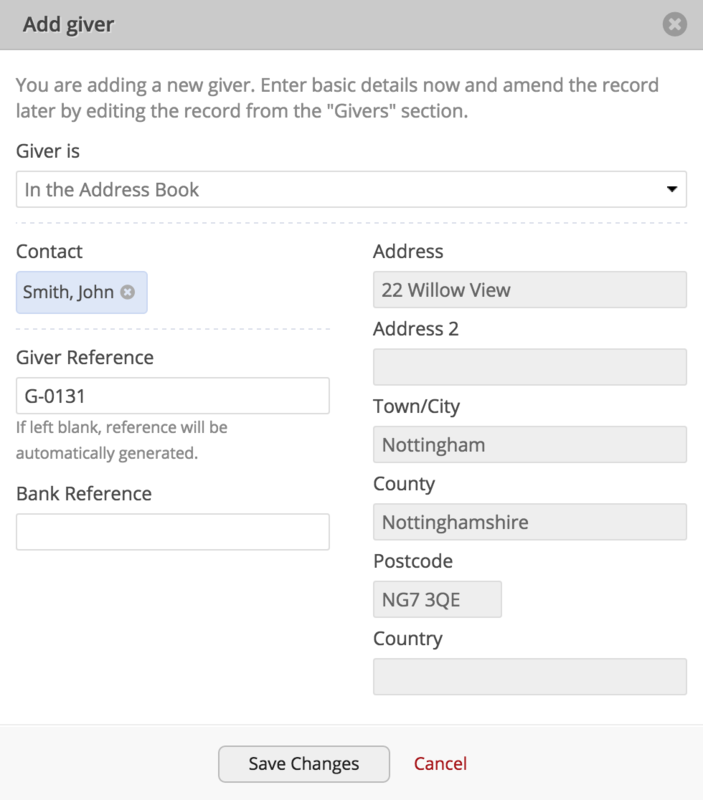 Importantly, ChurchSuite can store multiple bank references for a giver, so that if a giver makes donations from different bank accounts (or changes a bank account), the system will keep your giver records up to date. Having linked donations to givers, note that you can also choose a Fund (giving Funds need to be set up first under "Giving" > "Funds"). If the fund name is precisely specified in the import file then that fund will be selected, otherwise your default, first fund is selected. This can be changed as appropriate. The Method can also be changed for each donation as appropriate, or this can be specified in the import file prior to import. You can Pause import at any time and return to your partially imported batch of donations. Once you've finished reviewing each of the donations in the list, click Save Donations at the bottom of the list and the donations will be processed into your Giving module as a batch. Only donations that have a Giver linked will be imported. In this way, you can complete partial imports of just those donations that you can match to a giver and return to a partial import to complete later. There's a single pledge for the fund on the donation date. There are multiple pledges for the fund on the donation date AND the donation amount is either an exact multiple of the pledge recurring amount or the exact one-off pledge amount. Donations will not be auto-matched to a pledge where the donation could match multiple pledges based on fund and date, but the amount is neither a multiple of the recurring pledge amount nor equal to the one-off pledge amount.